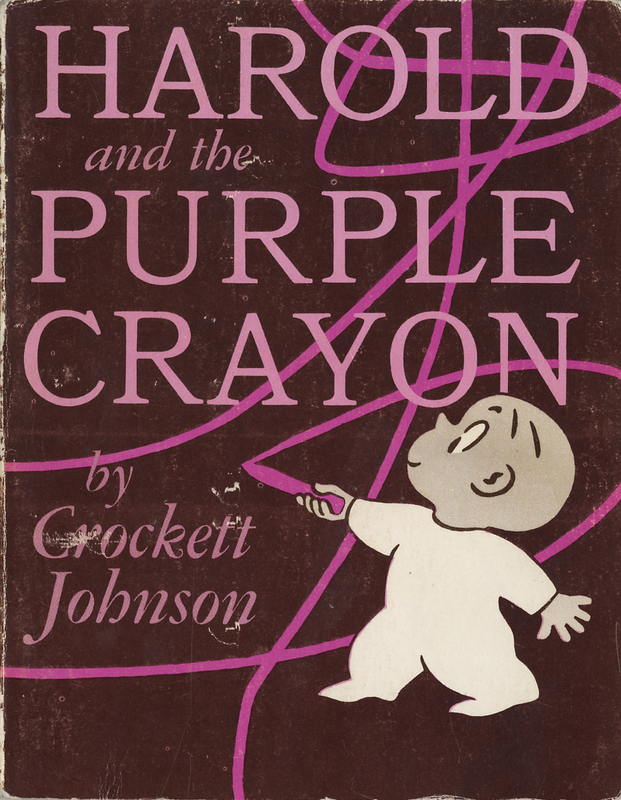 To celebrate Crockett Johnson‘s 110th birthday, I offer some advice on how to read Harold and the Purple Crayon (1955). Sort of. This is not so much “advice” as it is a glimpse of my work-in-progress, How to Read Harold: A Purple Crayon, Crockett Johnson, and the Making of a Children’s Classic. The book (when finished, and presuming anyone wants to publish it) is both a biography of a book and a succinct introduction to how children’s picture books work. Crockett Johnson’s Harold and the Purple Crayon reveals how complex an apparently simple story can be, and offers a case study in what we miss when we underestimate, trivialize, or simply fail to look closely at the art of the picture book. Indeed, the book’s deceptively transparent aesthetic makes it ideal for this purpose because, at first glance, most people would deem the book self-explanatory. What more can be said about a boy, a crayon, and the moon? In what is currently 15 very short chapters (and will ultimately be perhaps 25 very short chapters), I offer different ways in thinking about one book — and, in this sense, I’m making a nod to Mark Newgarden and Paul Karasik‘s forthcoming How to Read Nancy, a brilliant close-reading of a single Nancy comic strip. More than merely an expansion of their original essay, the book offers 43 ways of reading the Aug. 8 1959 Nancy and, in so doing, provides a master class in how comics work. I’m hoping to achieve something similar for picture books. Here, then, is an extract from How to Read Harold. Enjoy! Thanks to the stylistic consistency of Johnson’s clear line, Harold and his artwork all inhabit the same reality. Their shared aesthetic allows Johnson to convince us that, for example, oscillating between two and three dimensions is perfectly normal. Or, at least, this oscillation — which begins at the moment when Harold draws the path — convinces most people. It puzzled both of Johnson’s editors. Looking at Johnson’s dummy, his editor Ursula Nordstrom said, “I found myself asking such dumb questions — like where did he draw the moon and the path and the tree?” First among a list of “The parts I am not too sure of,” Harper reader Ann Powers also named “the pathway at the beginning (too strange? ).” It may be strange, but when Harold is standing in an empty void, it also makes sense for him to draw a “long straight path.” It’s practical. It anchors him. It also creates the illusion of three dimensions in what has — up to this point — been a two-dimensional space. 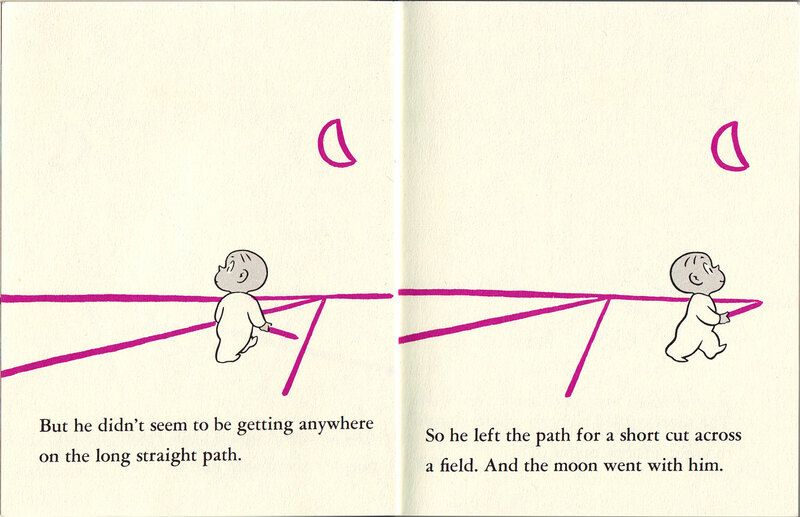 Unlike most pre-schoolers, Harold understands the vanishing point. In one sense, the observation that “he didn’t seem to be getting anywhere on the long straight path” echoes such advice as “taking the road less traveled” or “getting off the beaten path.” Harold’s decision to leave it announces his creativity. In another sense, the observation is literally true. His drawing only appears to have three dimensions. He’s actually on a flat page. The most he can do on this “path” is walk in place. To get anywhere, he needs to acknowledge the flatness of the page and walk off the path, into a new space, blank and ready for his crayon. As he departs from the path, “the moon went with him” suggests a three-dimensional reality — even though only some of Harold’s drawings actually have three dimensions. The dragon and boat are 2-D. The pies and picnic blanket are 3-D. The balloon begins as one-dimensional (a curved line), becomes two-dimensional (a circle), and ends as three-dimensional (two ropes extending behind, and two ropes in front). But its basket stays two-dimensional, as does the house it lands in front of. Yet these differing numbers of dimensions (often on the same page) don’t seem inconsistent or out-of-place because the moon helps trick us into seeing these scenes in a three-dimensional space. When we walk at night in the real, physical world, the moon seems to follow us. The moon is the only part of Harold’s drawing that’s able to move, hovering over his head, far off in the distance, as he walks along. Though neither named in the title nor represented on the cover, the moon is as important as Harold and his crayon. Perhaps acknowledging the moon’s key role in this trio, two later Harold books feature the moon on the cover: next to a tightrope-walking Harold on Harold’s Circus (1959) and as the “D” on Harold’s ABC (1963). 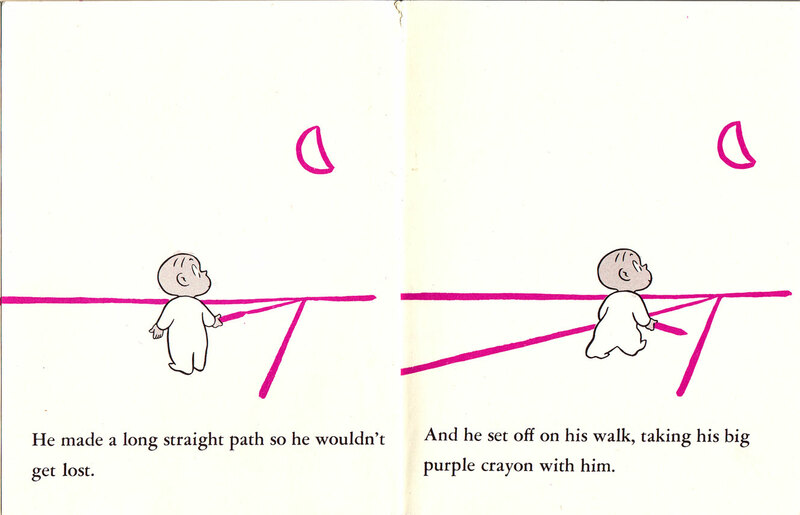 The moon is Harold’s companion throughout Harold and the Purple Crayon, and the third constant visual motif. After its introduction, the moon appears in every scene (every page or two-page spread, in the four “city” pages) — along with the two other constants (Harold and his crayon). Harold might be read as a stand-in for the reader, the crayon as his (or our) imagination, and the moon a guiding light. Or, better: Harold is the artist, the crayon his medium, and the moon his muse. 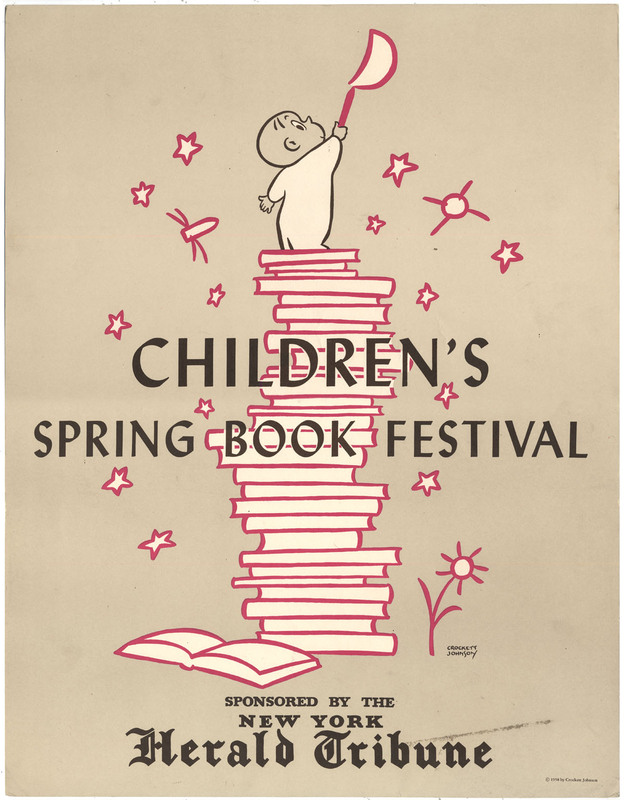 Crockett Johnson’s poster for the 1958 New York Herald Tribune Children’s Spring Book Festival courtesy of Chris Ware. A Manifesto for Children’s Literature; or, Reading Harold as a Teen-Ager (21 Sept. 2015). An essay of mine in the the Fall 2015 issue of The Iowa Review. Thank you! It’s fun to look closely at art! I am so very excited for the birth of your book! You’re the only person I’ve found who appreciates this treasure as much as I do. Please, oh please, let me know as soon as it’s ready. As a lover and enthusiastic seller of children’s books, I’d love to have an ARC. Well, *I* for one am interested and definitely look forward to reading more! Thanks, Amy & Rockinlibrarian! I should say that this project (How to Read Harold) is likely several years away. I tend to work on many projects at once, each in a different phase of its development. The next books out will be the ones already under contract. (This one is not under contract — it’s just something I’m working on).